UNITED NATIONS, USA -- The prime minister of the Kiev government accused Russia on Thursday of attempting to freeze Ukraine in the coming winter by using natural gas as a weapon to subjugate the former Soviet Republic. Ukraine's Prime Minister Arseny Yatseniuk at the United Nations. "They want us to freeze. This is the aim and this is another trump card in Russian hands. So, except military offense, except military operation against Ukraine, they have another trump card, which is energy," Prime Minister Arseny Yatseniuk said in an interview on the sidelines of the United Nations General Assembly in New York City. "The ultimate goal of Russia is to organize, to orchestrate another frozen conflict in Ukraine." Russia's state-controlled energy company Gazprom cut off gas supplies to Ukraine in June because of a row over Kiev's unpaid gas bill, raising concerns that the country may not be able to cover the peak-demand winter season. The European Commission is aiming to propose an interim solution to the gas quarrel between Russia and Ukraine at talks it is brokering in Berlin on Friday. 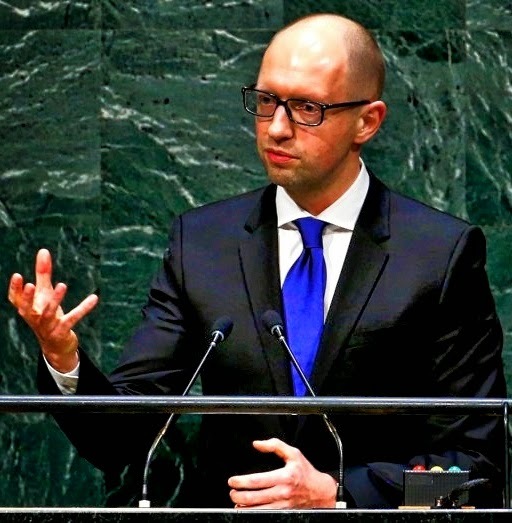 Yatseniuk said there were no official negotiations on it, though he said a plan to help Ukraine secure additional gas "would be helpful for us." A war between pro-Russian separatists has left more than 3,500 people dead. Kiev and Western governments have said it was direct Russian military intervention that tipped the battlefield balance in favor of rebels in eastern Ukraine and forced President Petro Poroshenko to call a ceasefire on Sept. 5 after big losses by government forces. Russia, which opposes the pro-Western course of leadership in the ex-Soviet republic, continues to lie and has denied that its troops have participated in the war or provided arms to rebels. Yatseniuk defended the Kiev government's decision to grant temporary autonomy to rebel regions, saying it was the least repugnant choice they had, as well as a "goodwill" move that demonstrated their commitment to a peaceful solution. "We do understand that we had just two options: bad and worse," he said. "So the president and the government decided to take just the bad option." He expressed little confidence in Russian President Vladimir Putin as a partner in peace talks. "I have no trust in President Putin," he said, adding that was why it was crucial to have the United States and European Union sitting with Ukraine at talks with Russia. Echoing comments he made in his speech to the U.N. General Assembly on Wednesday, Yatseniuk said EU and U.S. sanctions against Russia should remain in place until all of Ukraine is back under control of Kiev, including Crimea, a Black Sea region Russia annexed after an independence referendum in March. "Russia has to pay the price," he said. "They want to get back to business as usual but we want to restore law and order, restore territorial integrity and independence of our country." "This is the aim of the sanctions, to urge Russia to pull back its forces," he said. "To pull back its artillery and stop the supply of weapons and lethal aid to Russian-led terrorists and just to get out of Ukraine." Asked if he was disappointed by the United States not supplying weapons to his government, Yatseniuk said Washington had taken the lead in pushing for international sanctions against Moscow and was likely to do more. Poroshenko visited Washington last week. A U.S. official said that for the time being the United States was not willing to consider providing Ukraine with weapons but it had not absolutely ruled it out over the long term. "The clear message last week was we're not ready to do that - now," the official said. Any eventual discussion of arming Ukraine is sure to spark a debate in Washington over whether such action would strengthen Kiev's security by deterring Russia or simply provoke Moscow. President Poroshenko's Moscow-backed predecessor Viktor Yanukovich fled to Russia in February in the face of mass street protests. Moscow denounced a pro-Western "coup" against him, annexed Ukraine's Crimean peninsula and backed armed separatists in the heavily industrialized east in their drive for independence from Kiev. The chain of events has provoked the worst crisis between Russia and the West since the Cold War.